In this New Year’s episode, Robert and I critique Forbes’ heavy-handed approach to blocking ad blockers and its promise of a “light ad” experience for visitors who agree to comply. Is there a better way to handle this? We think so. Next, we are pleasantly surprised by The Association of National Advertisers (ANA) decision to declare content marketing as the marketing phrase of the year and we share our thoughts on what marketers need to do to be successful with content marketing in 2016. We scratch our heads over The Federal Trade Commission’s (FTC) recent policy statement regarding native ads, and we explain why it won’t work. Finally, we try to make sense of Ev Williams’ proclamation that the future of media lies in platforms like Twitter, Facebook, and Medium. Rants and raves include a comparison of the audience-building potential of YouTube vs. Facebook and The Business Romantic’s refreshing look at business and life. We wrap up the show with a #ThisOldMarketing example of the week: Komputronik buys Benchmark. Forbes blocks ad blockers (6:18): Forbes has begun denying access to some people with ad blockers on their devices, presenting them with a notice asking them to turn them off in order to see the requested content. Users who agree to do so are rewarded with an “ad-light experience,” in the hopes that they may be persuaded to remove Forbes from their personal list of ad-blocked sites. Robert and I think this is a heavy-handed approach; we brainstorm several ways Forbes could handle this situation in a much more positive way. ANA says content marketing is this year’s word of the year (12:40): The ANA has announced that content marketing is this year’s marketing word of the year. It was selected based on votes cast by nearly 300 of ANA’s marketer members. Robert and I agree this is quite significant, considering that ANA’s membership has always been focused more on B2C than B2B marketing. We discuss why brands can no longer “dabble” in content marketing – they need to make a commitment to it in order to be successful. 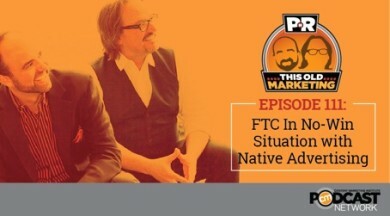 FTC releases native advertising guidelines (21:28): The U.S. Federal Trade Commission (FTC) recently released an enforcement policy statement and business guidance that spells out its rules for native ads more explicitly than ever before. According to the policy, the FTC will examine a number of factors to determine if an ad is misleading. Robert and I agree that this policy appears to be all bark, and very little bite – in other words, it’s unenforceable. We explain why, and predict what will happen next. Medium’s Ev Williams: ‘It’s going to make less and less sense to publish on the web’ (31:06): Ev Williams made it easy for people to say what they want online. But the man who created Blogger, then Twitter, and now Medium says the web is on its way out, at least as a place to publish your thoughts. In an interview with Peter Kafka on the latest episode of Re/code Decode, the Medium CEO said the future of media lies in platforms like Twitter, Facebook, and Medium. We discuss the perils of this strategy, which is no different than building an audience on other “rented” social media platforms. If you don’t own it, you don’t control it. We also explain why Williams is promoting this strategy. CMI University: Winter enrollment for CMI University’s online training curriculum is now open through January 4, 2016. Enrollment will be limited to the first 500 students. CMI University includes over 20 hours of specialized content marketing training, from planning to measurement. If you sign up before January 4, 2016, you will also get free Content Marketing World 2015 video-on-demand access (a $595 value) and free Content Marketing Show 2015 video-on-demand access (also worth $595). For all the details, visit http://cmiuniversity.com. Joe’s rave: Matthew Patrick (MatPat), host of the incredibly popular Game Theory channel on YouTube, recently published an episode that asks, “Will 2015 be the end of YouTube Rewind?” This is an annual end-of-year recap video, which features many of the YouTube superstars re-enacting the year’s most popular memes. In this video, he does a fascinating comparison of the demographics of YouTube and Facebook, how each channel monetizes content and why it’s a bad idea to try to build an audience on Facebook. This video contains many lessons for content marketers! 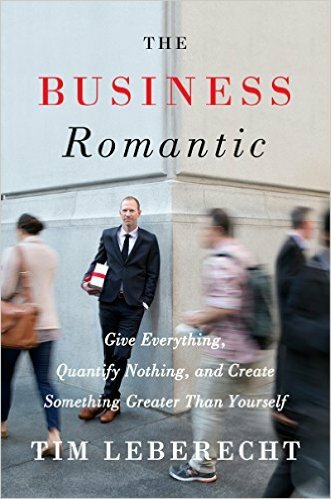 Robert’s rave: Robert loves a book he received for Christmas: The Business Romantic: Give Everything, Quantify Nothing, and Create Something Greater Than Yourself by Tim Leberecht. Its unique premise is that, in today’s hyper-quantified and technology-infused world, we ought to look at romantic thought – building something meaningful with our talents – as a foundation for becoming a successful person. It’s a refreshing look at business and life. Komputronik buys Benchmark: Komputronik, one of the best-known Polish computer producers and distributors, acquired the benchmark.pl technology portal in 2007 for zl.2 million. This computer enthusiast website has given Komputronik a valuable, trusted channel to reach computer enthusiasts for nearly a decade. A visit to the Benchmark.pl website shows a wealth of recent computing and gaming news, articles, videos, and other content. Alexa shows it ranks among the top 10,000 websites in the world in web traffic. This is an excellent example of a manufacturer purchasing a popular media website in its industry to gain access to its large audience. It’s also a very good example of #ThisOldMarketing.